children it is important that they see, hold, and feel the past manifest in coins, artifacts, sculpture and temples. the past. The word entry point is to be noted since study of temples should not become an end in itself. i.e. who built it, when it was build, it is perhaps more important to know how and why it was built. When did temple construction start in India? Temples were not being built since time immemorial as many would like to believe. later perfected by the medieval Chalukyas, Hoyasala and Vijaynagar dynasties. Bhakthi movement and temple building emerged concurrently. that can be gleaned from any of the innumerable websites or books. 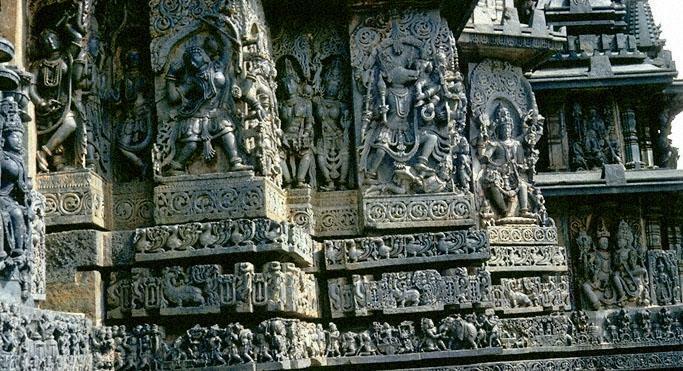 how temples fulfilled a important social and cultural role other than religious. The fact that the temples remain elegant and majestic and the dwellings of the mighty rulers who got them built are rather obscure goes to show the power wielded by the structure itself! A parallel connection could also be drawn as to why and by whom were the earlier cave temples.. Aajanta Ellora etc.,! sculpted and later forgotten . The mushroom temple building activity( of course with little regard to aesthetics) of the democratic rajas( read influential citizens) today.. suggests the continued role of temple building as an access to higher social strata or maintaining the order! There are voices of dissent heard here and there to break the legitimacy of the temple ownership and the hierarchy that exists therein. The hitherto “ others” have started claiming preferential ritual rights and also in temple feeds. In a temple in Nuggehalli the orthodox Srivaishnavas had to forego temple food on the Car festival day as the others rushed to partake it along with them! Temples not so famous like the one spoken above and in my own village Kadaba would lose its patronage unless the community redefines the role of a temple. I belive people created god and everything associated with it. It is their way of reasoning....but thinking of it ..isn't science a 'make belief' too??? Isn't science just a whole bunch of crap put together in order to reason? Not that I support the modern temples, but why not have a few to tell our tales? The modern temples need not replace the old ones....can't they co exsist?? Why just try to retain the old? People always try to live in the past or the future..why not the present????? ?